The K300 Washlet offers more of a mid-level bidet seat option from TOTO that is a slightly pared down version of their high end models but a nice step up from their bulkier entry-level washlets. The K300 uses a tankless water heating system for which provides continuous on-demand heated water for warm water washing. Having the tankless water heating system allows the K300 to have a more streamlined body than the bulkier entry-level washlets using the reservoir tank heating system, so aesthetically it is more similar to the high end TOTO models. At its tallest point, the K300 is about a quarter inch higher than the S500e and S550e which have the narrowest profile of all our bidet seats. While the K300 washlet does not have two different lid design options like those seats, it does have an updated look that is similar to the popular Modern style option of the S500e and S550e. 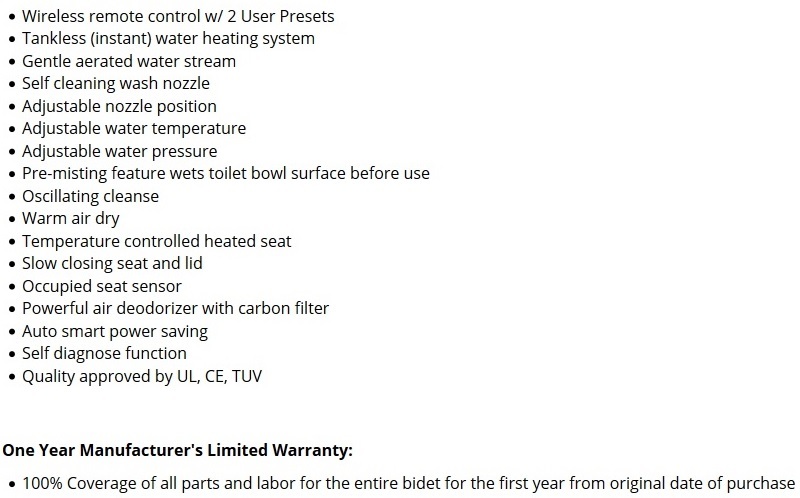 In addition to the high-end appearance, the K300 has many high-end features you would expect from a TOTO brand bidet seat. 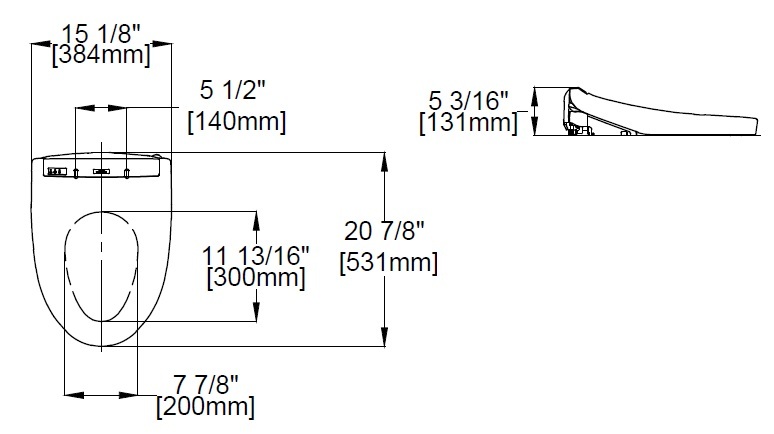 Besides the adjustable water temperature and water pressure, users can also adjust the position of the wash nozzle. The single nozzle system has a separate spray port for a feminine and posterior wash. The posterior wash has a regular rear spray as well as a soft rear spray that utilizes a wider spray pattern. Oscillating cleansing, which moves the wash nozzle back and forth during the wash cycle for either posterior or feminine cleaning, allows for a more thorough cleaning. The slim wireless remote control is double-sided with the most often used features on the front side. The remote has two user presets so that two people can save their preferred wash settings. Some of the non-wash features included on the K300 are an adjustable temperature heated seat, warm air dryer with adjustable air temperature, a built in air deodorizer, a slow closing seat and lid as well as a nozzle cleaning feature. It also have energy saver settings that reduce the power consumption to almost nothing when not in use. Like the S500e and S550e, the K300 also has a bowl misting feature that sprays the surface of the toilet bowl to help keep it clean. One big difference though is that that the K300 does not use the e-water feature of the higher end TOTO models, so the bowl misting and nozzle cleaning do not have the same sanitizing effect. While the K300 Washlet doesn't have all of the bells and whistles of the top of the line TOTO washlets, it does pack many great features users want to have in a bidet seat. For anyone looking to get the quality of a TOTO brand washlet at a more mid-level price, the K300 Washlet is a great option.